ICM has been a leader in the provisioning of automated baggage handling systems for airports since 1977. Our range of ‘Auto Bag Solutions’ address the mission critical processes at airports for handling and managing passenger hold baggage. From bag tagging and drop off to screening and loading, our products and services revolve around automation of baggage processes. 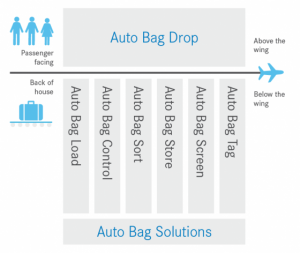 Our solutions cover “above the wing” passenger bag drop processes to “below the wing” baggage ramp operations. Our approach is to provide uncompromised safety and security along with reliability and efficiency. As an experienced systems integrator we work in close partnership with our clients to ensure their needs are fully met. We achieve this through providing best in class process-engineered solutions based on the most appropriate range of equipment. ICM uses its unrivalled baggage processing and operational knowledge, together with its specialist engineering skills in automated baggage handling and control systems development, to deliver the optimum solution in terms of cost, efficiency and reliability. Our engineering and IT teams have experience in baggage system design, control systems development, self-service bag drops, and general airport-based baggage systems. 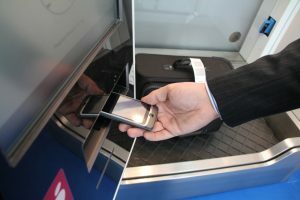 These unique skills and our extensive experience ensure that ICM is recognised as an industry sector leader in the provision of automated baggage solutions. ICM Airport Technics is well positioned to provide improved baggage handling solutions for any client. We are part of the Unitechnik Group, a worldwide logistic system integrator with offices in Germany, Australia, China, USA, UK and United Arab Emirates. 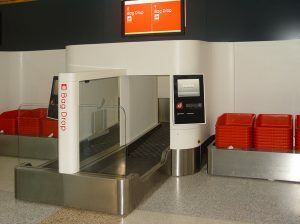 ICM’s Auto Bag Drop (ABD) enables passengers to check-in their baggage by themselves without having to queue at a check-in desk. Proven for single and common-use airports in both domestic and intenational environments. 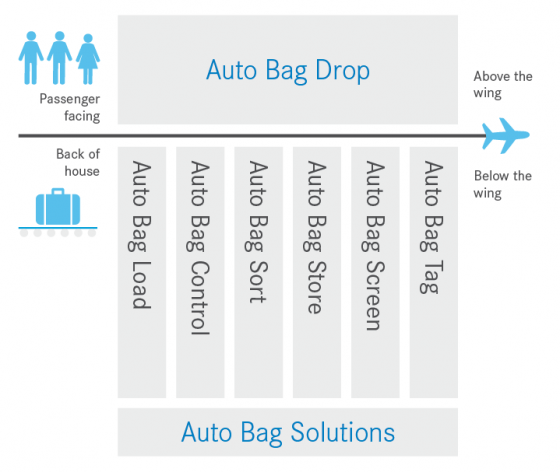 Our Auto Bag Drop uses a simple, intuitive graphical user interface. Easily configurable for specific airline requirements and branding. Baggage is automatically checked by determining the bag weight, dimensions, volume, shape, conveyability and RFID or barcode bag tag. A key design feature is the side-loading of bags which is easier than front loading and provides a clear safe area for passengers. The aesthetic design provides a non-intimidating user experience. 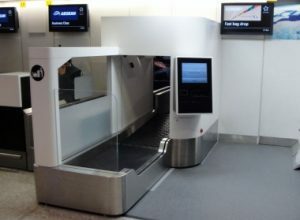 Using patented technology, anti-intrusion systems prevent any kind of trapping or injury to passengers, as well as maintaining the integrity of the weighing process. Security is maintained by a series of light curtains used to detect intrusion by persons or objects entering the conveyor system. Non-conveyable and multiple bags are detected using advanced 3D analysis. 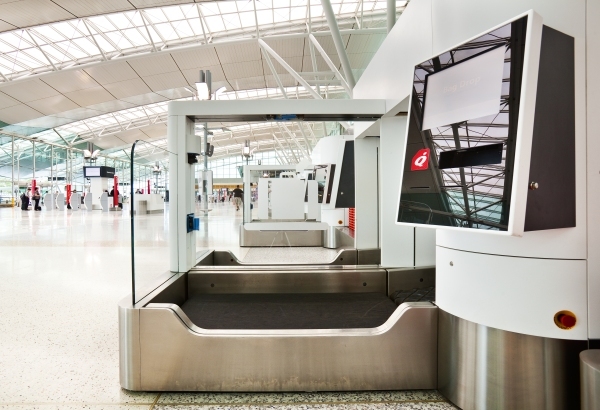 Optional biometric systems can be readily integrated to meet airport and airline specific security requirements. The Auto Bag Drop is designed for a two-stage check-in process which optimises the use of real estate in the airport departures concourse. The two-stage check-in process results in significant savings in both expenditure and footprint. All processes are conducted on the first belt resulting in fast transaction times and improved workflow processes. Excess baggage and heavy bags are efficiently processed based on airline requirements. 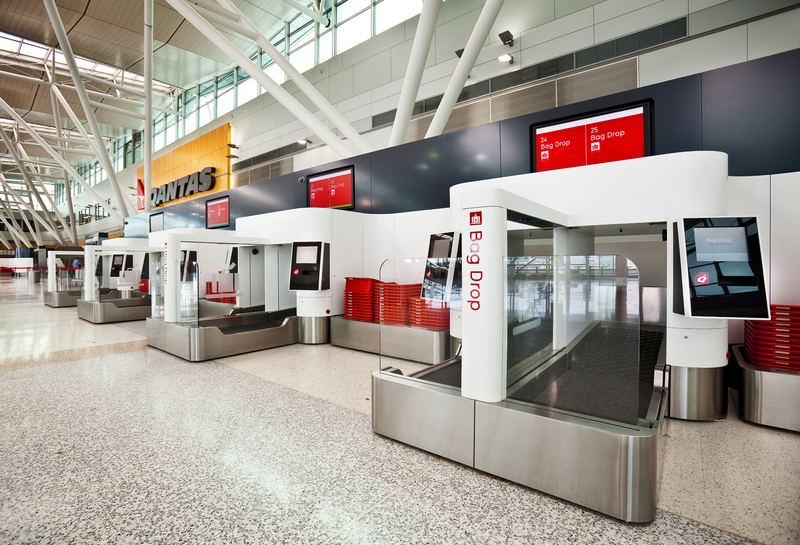 Our Auto Bag Drop Series 1 and 3 are designed to be retrofitted into existing check-in desks, whereas our Series 5 and 7 models are designed to replace existing check-in desks. 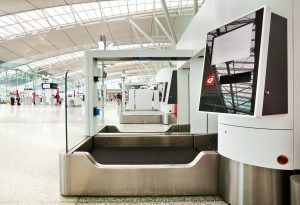 All models can be seamlessly integrated into the terminal design with interfaces into baggage handling, departure control, security and overhead display systems. Our team of dedicated support experts is available to give you peace of mind and ensure business continuity whenever you need it. A touch-screen monitor welcomes the traveller. The system scans the boarding pass. Boarding details are checked and validated. The passenger places his bag on the weigh-scale conveyor. The bag is weighed and dimensions are checked. If excess weight is detected, the passenger can opt to pay the fee or to repack their bag. If required, a heavy tag is printed. The bag is processed, the bag tag is activated and the bag is sent to the baggage handling system. Use of tubs is supported.